Please bring your student id along. As the pace of change accelerates around our businesses and the sheer volume of information explodes, we're under incredible pressure to connect just in time with the people and ideas we need to thrive, even when we don’t know who they are or where they might be. This uncertainty isn’t a problem, however–it can bring tremendous opportunities, but only if we embrace one of the most important but unexpected drivers of success in the modern economy: serendipity. Serendipity isn’t an abstract, magical notion–it can be planned. Though we can’t know exactly when serendipity will strike, we can foster the conditions for it to occur early and often. 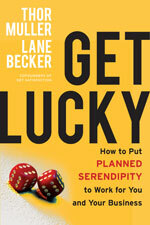 Luck isn’t lucky–it's learnable. This session will show you how the world’s most admired businesses, such as 3M and Pixar, have applied the essential skills of serendipity to guarantee success in their businesses, over and over again. Join us for a Special Edition of the DNS Business 101 series with Lane Becker – Internet Entrepreneur, VC Advisor and Author. Also, dont forget to register for our Annual Dinner and listen his Keynote on "The Rise of Global Technology Culture"
Register NOW as seats are limited for this special edition session!